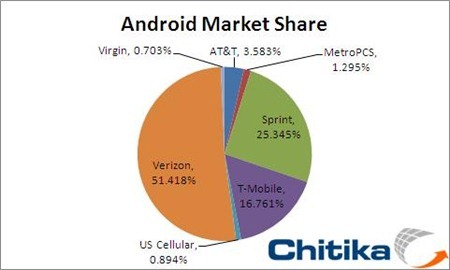 According to the latest from ad network Chitika, Android market share is far more lopsided than you probably imagine. That Verizon is the largest is perhaps not surprising, given the data we've seen time and time again. What is surprising is just how much of a lead they have: the company accounts for a whopping 51.4% of the market. Sprint comes in at second with 25.3%, while T-Mobile pulls up third with 16.8%. Meanwhile, AT&T checks in with a measly 3.6% - embarrassingly low, to say the least. Given how much of a push T-Mobile has made with Android, it's perhaps surprising to see that they only have 16.8%; then again, they are the smallest of the four, and it's understandable that their market share would suffer commensurately. AT&T does have a rather valid excuse in that the iPhone has long been their flagship smartphone, but even so, they do offer popular devices such as the Samsung Captivate.